Fake Scotch whisky worth close to £1 million has been removed from the market in what one broker has called “just the tip of the iceberg”. Read more: What is Dragon 8’s ‘MW35’ whisky? 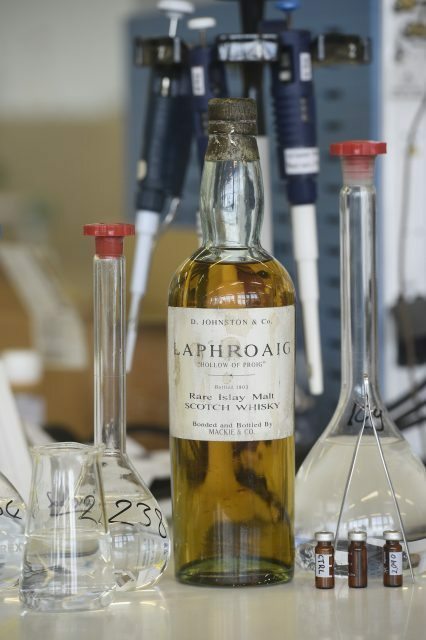 Rare Whisky 101’s founders, Andy Simpson and David Robertson, reportedly acquired the bottle of Laphroaig at an auction in 2015 (the Macallans were simply authenticated) and subjected it to a series of tests over six months; including examinations of its glass, cork and capsule and an analysis of its peat derived compounds and malt and grain compounds to prove its provenance. A sample was even carbon dated at Oxford University’s Radiocarbon Accelerator Unit. Although this method generally cannot return absolutely precise findings, the results suggested a 75% chance that the liquid was created between 2007 and 2009. Coupled with results from other tests which showed it was a blended Scotch not a single malt, the conclusion, very clearly, was that it was a modern fake. The whisky was supposedly bottled by Mackies, which is clearly a ‘unicorn’ bottling for collectors of Scotch – and therefore one of the more counterfeited liquids. With the secondary market for whisky in the UK alone forecast to trade around 55,000 bottles of whisky worth around £12 million by the end of this year, both Davidson and Simpson stated that as whisky of all kinds continues to grow as an investment category so the number and sophistication of counterfeits is growing – and is likely already much larger than many estimates. Simpson stressed to the drinks business that the problem is not confined to Scotch whisky either. He explained how he had come across some counterfeit examples of the much admired and collected Japanese whisky Hanyu earlier this year as well. Japanese whisky is becoming increasingly popular in Hong Kong. Simpson’s statement that the Laphroaig had been “circulating at auctions for a good few years” has parallels with a claim made recently by fine wine authenticator Maureen Downey, who said that millions of dollars worth of fine wine faked by Rudy Kurniawan was still doing the rounds at auction.